When a butterfly takes off, it becomes airborne in less than a quarter of a wing beat and can experience a vertical acceleration of about 10 g! (1). 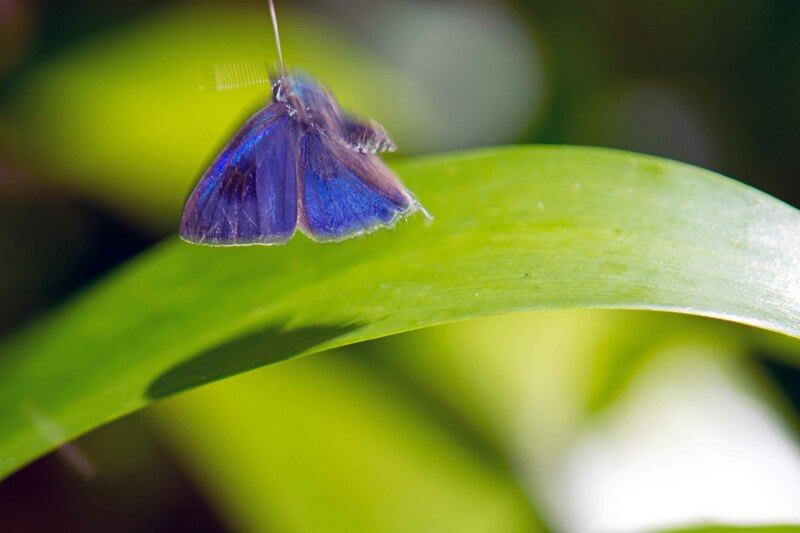 Butterflies use a so-called ‘fling’ mechanism to achieve these rapid take-offs: the opposed wings are ‘flung open like a book’, thereby creating aerodynamic lift and allowing air circulation over the wing in anticipation of the down-stroke (2, 3). Complex stuff! 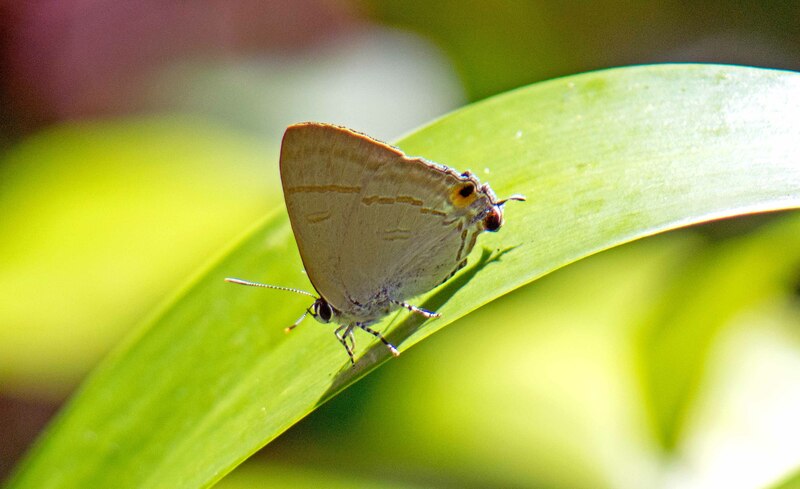 The legs of the butterfly are also important in generating an upward force and in raising the body of the insect above the substrate – the leaf surface – so that the wings can be fully flapped! (4). So that’s: jump, fling and flap! All in the blink of an eye. This was the position of the same butterfly before it took-off (below). The shutter speed I was using – 1/250th of a second – was way too slow to freeze the butterfly as it launched itself into the air but the blurred effect does at least give an impression of movement. At first sight it looks upside down, but it is just that the wings are in the full down-stroke position and the abdomen is showing. Sunada, Shigeru, et al. “Performance of a butterfly in take-off flight.” Journal of Experimental Biology 183.1 (1993): 249-277. Chen, Mao Wei, Yan Lai Zhang, and Mao Sun. “Wing and body motion and aerodynamic and leg forces during take-off in droneflies.” Journal of The Royal Society Interface 10.89 (2013): 20130808. Weis-Fogh, Torkel. “Quick estimates of flight fitness in hovering animals, including novel mechanisms for lift production.” Journal of Experimental Biology 59.1 (1973): 169-230. Bimbard, Gaëlle, et al. “Force balance in the take-off of a pierid butterfly: relative importance and timing of leg impulsion and aerodynamic forces.” The Journal of experimental biology 216.18 (2013): 3551-3563. Next Next post: A complex caterpillar! Excellent, I have been reading Sunada. Did you manage to work out what the peak acceleration is? Ray Cannon's nature notes Butterfly takes off!